Daebanggwangbul Avatamsaka Sutra is also called by its shortened name the Avatamsaka Sutra. The main idea in this Buddhist scripture is that the Buddha and all other living things are not two different entities, but one. 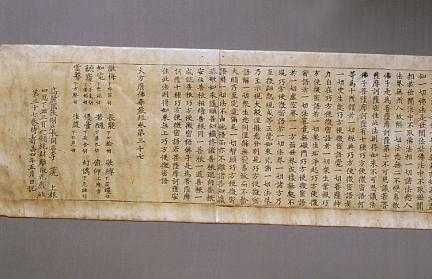 Along with the Lotus Sutra, this principal scripture of the Avatamsaka Sutra is one of the books that had the greatest influence in the establishment of Korean Buddhist philosophy. This is Book No. 37 among the 60 books of The Avatamsaka Sutra Jin Version translated by Buddhabhadra of the East Qin Dynasty of China. It is produced by woodblock printing on mulberry papers joined together in a row and designed to be stored in the form of a scroll. 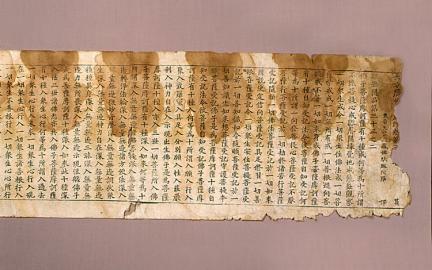 The scroll is 768.3cm long and 26cm wide. 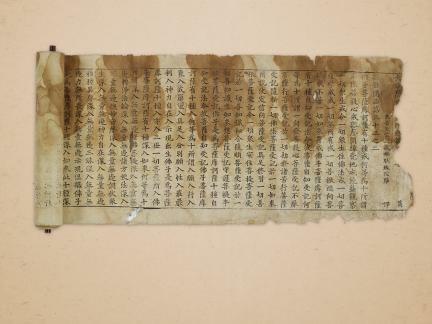 The remark at the end of the book says that it is published on an offering by a man named Yi Pil-seon in 1098 (the third year of King Sukjong of Goryeo). Although it is kept in a relatively good condition, the title of the book on the cover and the table of contents are partially missing while the main text is damaged because the book was found inside a Buddha statue. This is the oldest of the woodblock prints among the ones whose exact account of publication are known. It is an important material for the study of woodblock printing in the early Goryeo Period as well as various different xylographic copies of the Avatamsaka Sutra.